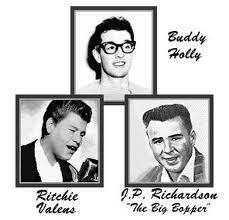 On this day in 1959 – A plane crash near Clear Lake, Iowa kills Buddy Holly, Ritchie Valens, The Big Bopper, and Roger Peterson also known as The Day the Music Died. This entry was posted in Uncategorized and tagged and Roger Peterson, Buddy Holly, Ritchie Valens, The Big Bopper. Bookmark the permalink.